Cloudy with a chance of rain ... later, after 5pm. 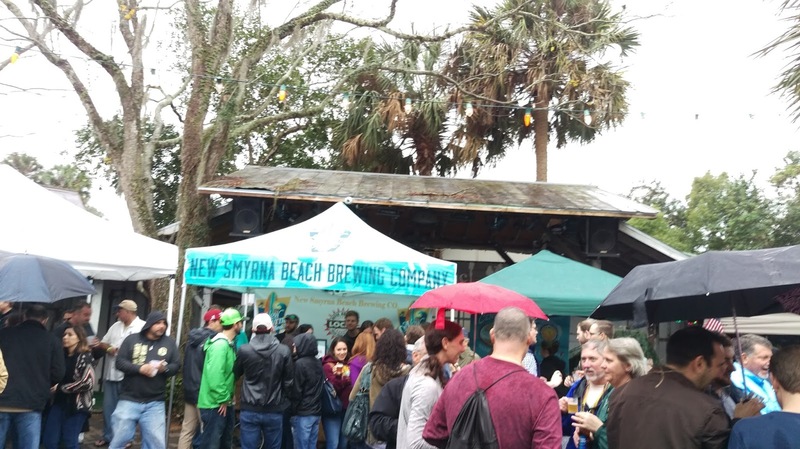 Saturday's early forecast for DeLand, Florida didn't include a postcard-perfect sunny Florida day from the get-go, but it looked like the rain would at least hold off until just about the time that Volusia Beer Week's DeLand Craft Beer Fest would wrap up. Uh-uh. 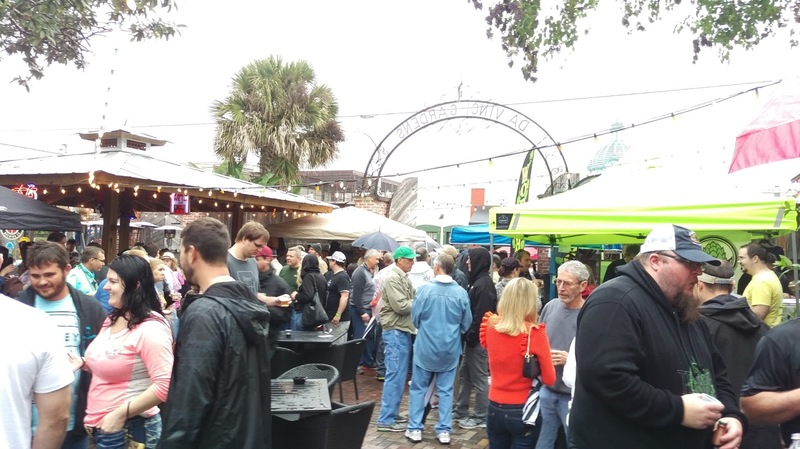 Around mid-day, Mother Nature decided to exercise her prerogative to change her mind for some reason, and she opened the clouds upon central Florida (sometimes I think she really needs a beer). 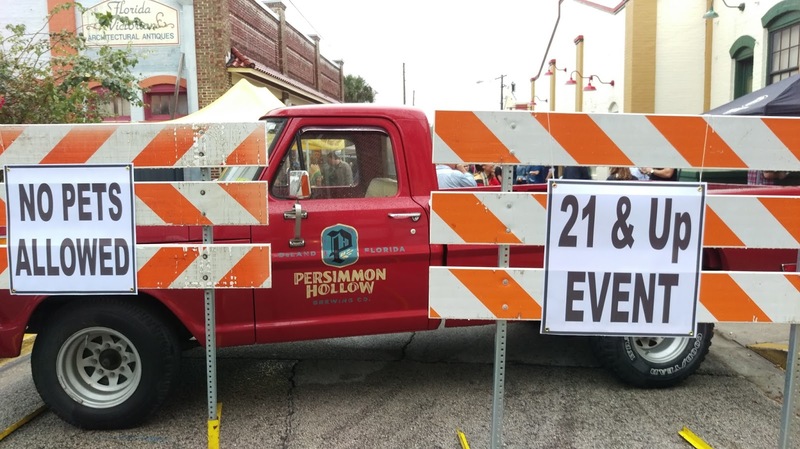 By this time, there was a line of patrons awaiting entry to the fest in downtown DeLand. Umbrellas popped up, and those stylish plastic rain ponchos became the wardrobe of the day (be prepared: always carry one). But, hey, this was a beer fest.... and, a little rain wouldn't dampen the spirits of these beer-drinking fans. So, over 1000 of us picked up our fest mugs and made our way through the entry tent and proceeded onto Georgia Ave. 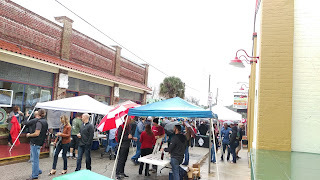 The fest was set up in several sections: national/regional breweries along Georgia Ave., Florida breweries inside the "garage," and local central Florida/Volusia breweries in the courtyard next to Cafe DaVinci. The set-up was a little different this year. 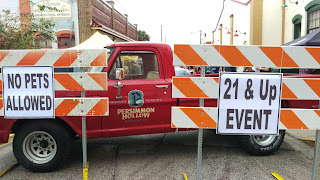 And, the hometown brewery, Persimmon Hollow Brewing Company, provided cover at the end of the street. 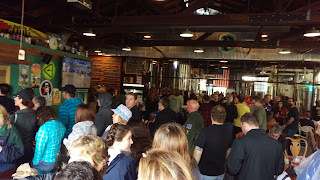 If you're not familiar with DeLand and Persimmon Hollow, check out my blog post from just over a year ago, written a couple of months after the brewery opened. 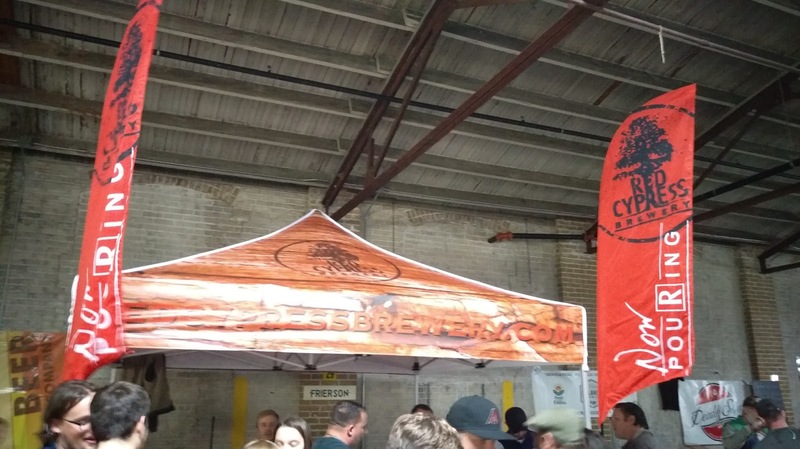 Over 60 breweries, meaderies and homebrewing shops participated in the Fest. Take a look at the list and map on the fest website. 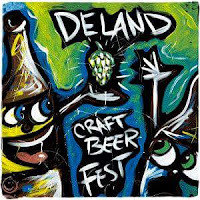 This was only my second visit to DeLand, and I was attracted to this fest particularly because of the local breweries and the number of new breweries featured from around the Orlando area. 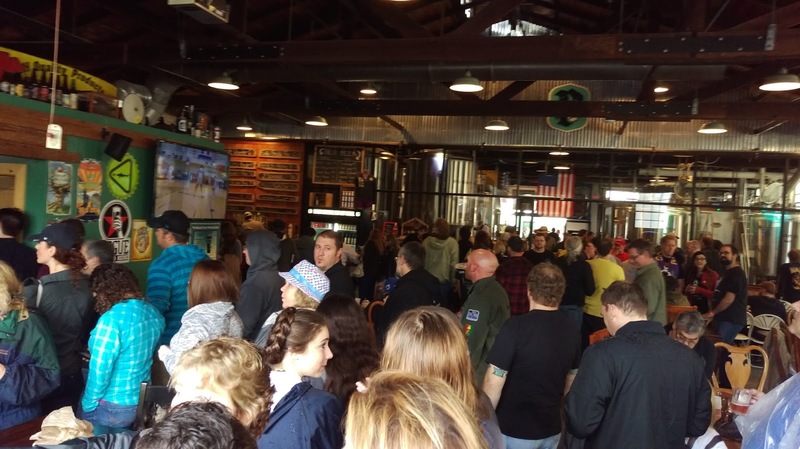 After sampling several of the brews from some of these breweries and chatting it up with the brewers/staff, I know that I need to make some more brewery visits to central Florida! The Courtyard was ready with tables and chairs, but unfortunately, they didn't see much use. 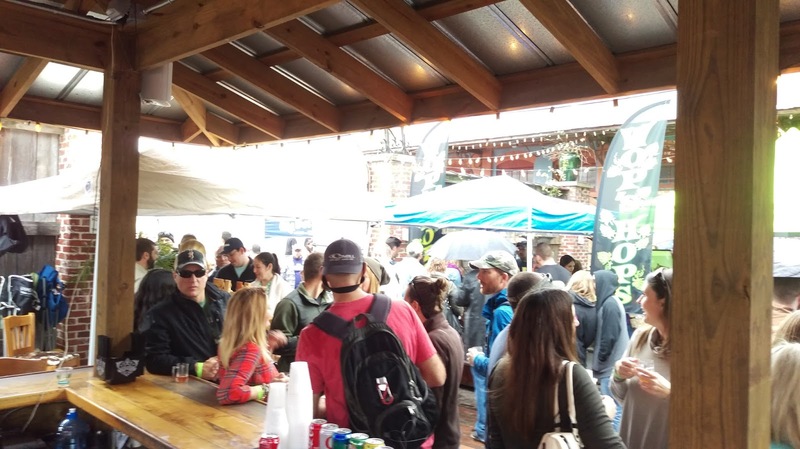 The covered overhang areas, along with the adjacent Cafe DaVinci, were popular places to huddle up with your beer and stay out of the rain. Although I must admit the weather made it challenging to take photos --- and I'm not too fond of the rain poncho despite its functionality --- as the day progressed (and as the beers were consumed), it didn't matter too much, and it was all about having a good time. If anything, it gives us something else to talk about. In fact, I even ran into a few guys from social media who I beer banter with but had never met in person before! 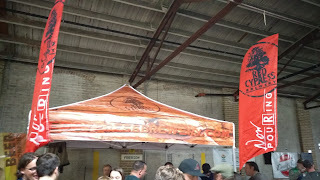 Yep, that's what happens at a beerfest! There were familiar faces (Hello, again, Tomoka Brewing), and some new ones under the tents in the Courtyard, filled with locals Ormond Brewing, Persimmon Hollow, Musquito County, Central 28, New Smyrna Beach Brewing, Daytona Beach Brewing, Tomoka Brewing, Wop's Hops, Odd Elixir MeadWorks, Mermaid Juice, Sanford Brewing and City Island Aleworks. I searched out some new beers. 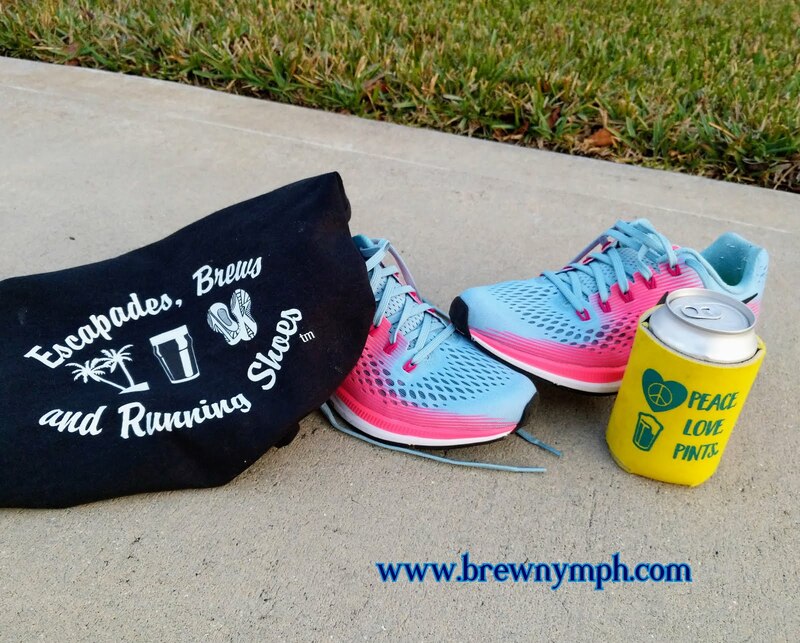 The Twin Beach Double Brown Ale from Daytona Beach Brewing is a 9% ABV ale made with brown sugar and aged on oak -- that sounded like something I could not overlook. It didn't drink like a 9-percenter, and I thought that the sweetness was complementary and not overdone. Another new one was Wop's Hops White Chocolate Amaretto Ale, which presented a combination of some savory tastes in a glass, as the name would suggest. Also, their Ode to Joy Winter Warmer tasted like a certain coconut-almond candy bar, but with more almond flavor, which I liked, too. (Bummer, no photos). Hey, it's Chris from New Smyrna Beach Brewing! (see my blog post from shortly after NSB Brewing opened). 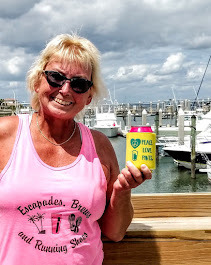 heading back from South Florida beertrips! By the way...Nice ride, Chris! 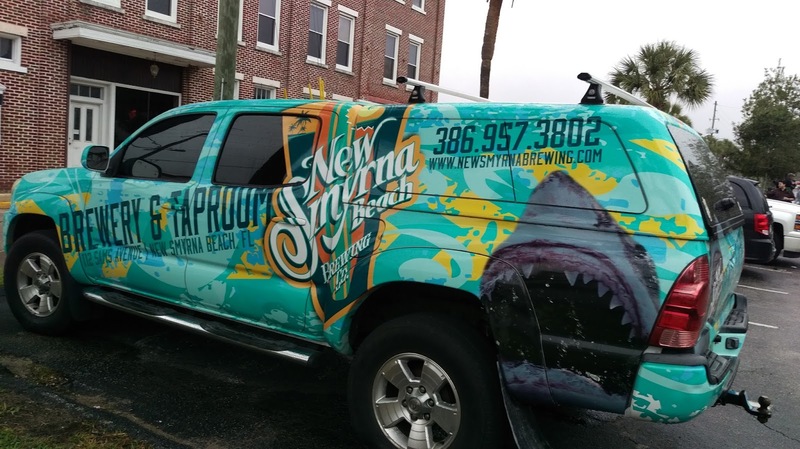 Breweries have the coolest vehicles. As you might expect, the "garage" area was heavily occupied all afternoon, as it was under roof. The building housed close to 30 Florida breweries from Orlando, Tampa, South Florida and more. I told you I would publish this! I was looking forward to trying the beers from Red Cypress Brewery, a new brewery that opened in Winter Springs last fall. 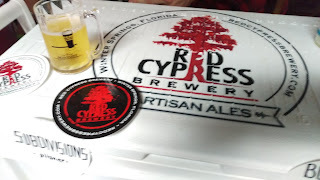 Red Cypress poured four beers, and I started with the Subdivisions Pilsner, a good representative of the Pilsner style, with its spiciness and hoppiness. I didn't move much from that location for a while. The Devil's Chair IPA was a citrusy IPA without being overly citrusy, which I thought also had a hint of spiciness. It's brewed with an experimental hop. OK, they're two-for-two. 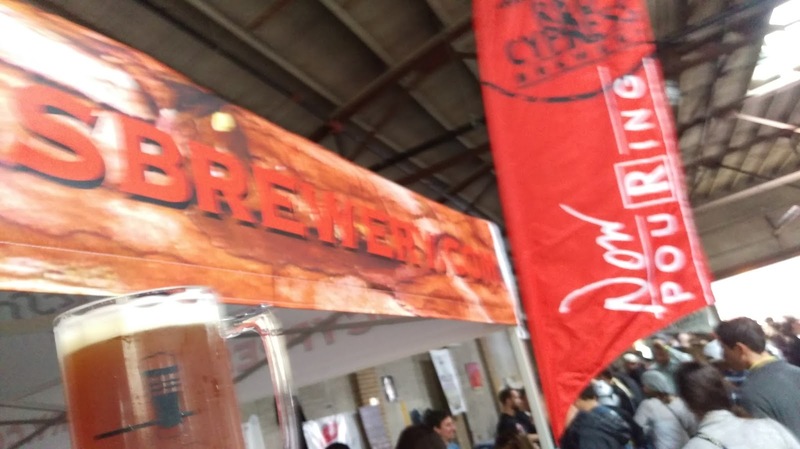 The Born to Lose Hoppy Red Ale, is appropriately named, and, yes it's hoppy, but not a taste-bud killer. 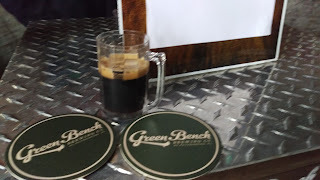 Lastly, the Robust Porter was roasty and smooth, and I had another one of those. OK, four-for-four for these guys. There's got to be a beertrip here in the future, and I'm looking forward to seeing these guys again! 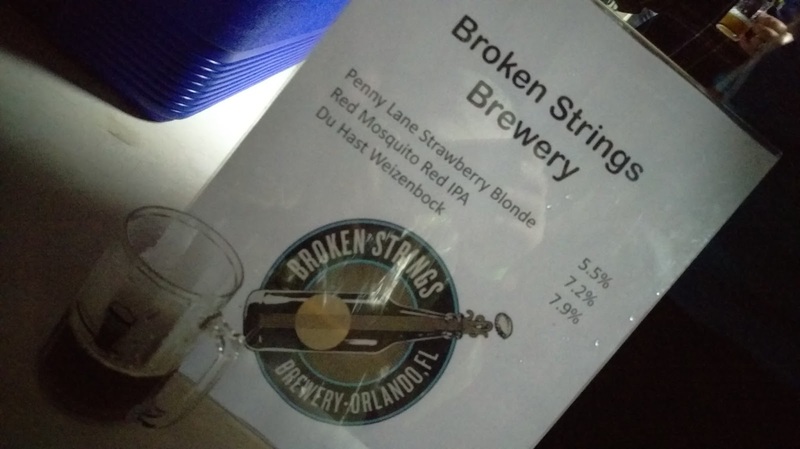 I also spent some time meeting and talking with the guys from Broken Strings Brewery, a close-to-opening new brewery and tap room in Orlando, not too far from the Citrus Bowl. 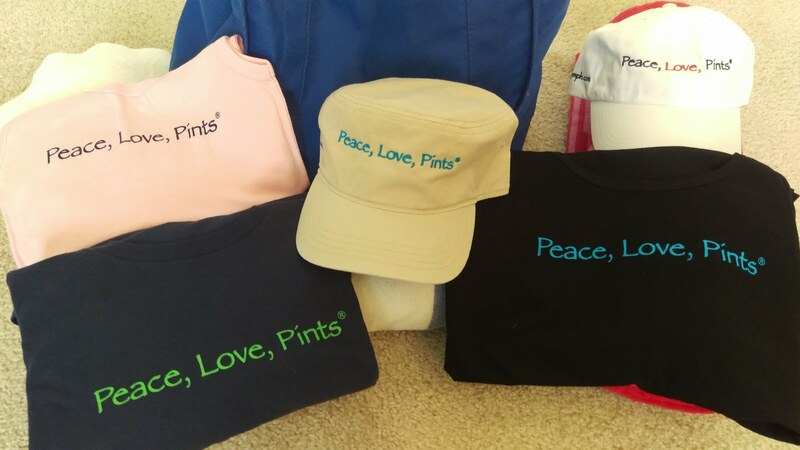 Their beers will have music-related referenced names. 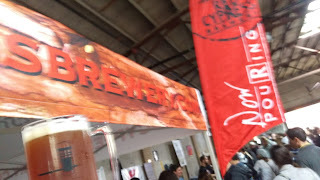 Really liked the Red Mosquito Red IPA (7.2% ABV). Stay tuned for updates on their progress. 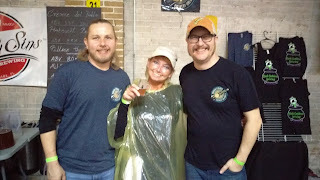 With Charles and Adam from Broken Strings Brewery. 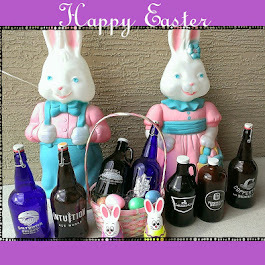 There were others, too, and I see some more brewery visits down the road! And, did anyone else have the Breakfast Porter from Green Bench Brewing from St. Pete? I think my comment after the first sip threw them a bit, but it was just so good! Made with maple syrup, lactose, oats, coffee and vanilla beans; smooth coffee taste and more. Yes, I'll have another one of those when I can! 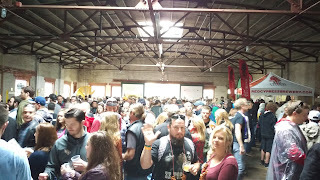 And, a shout-out to Persimmon Hollow Brewing, which pretty much anchored the fest at the other end of Georgia Ave. Good thing that they have a large, spacious warehouse here -- it was packed all day! 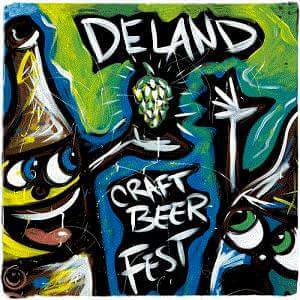 DeLand Craft Beer Fest is the premier event of Volusia Beer Week, which includes tastings all around Volusia during the preceding week. This was the sixth year for the Fest, which has enjoyed steady growth each year. 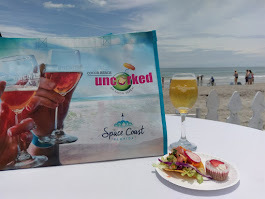 The "Beer Week," started in 2013, also features the "Brews & Bow Ties" beer and food pairing dinner, which brings together dishes from popular area restaurants and rare beers. 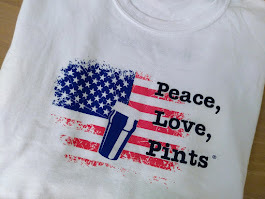 The Week also includes the "Mad Monk Mash-Up," a Belgian brew homebrew competition. 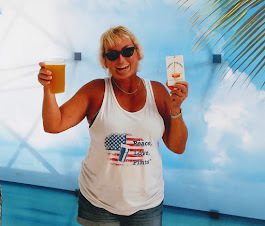 There was even a sold-out Drink Volusia Bus Tour which visited local breweries (I saw some photos of that, and I think they really knew how to enjoy beer). 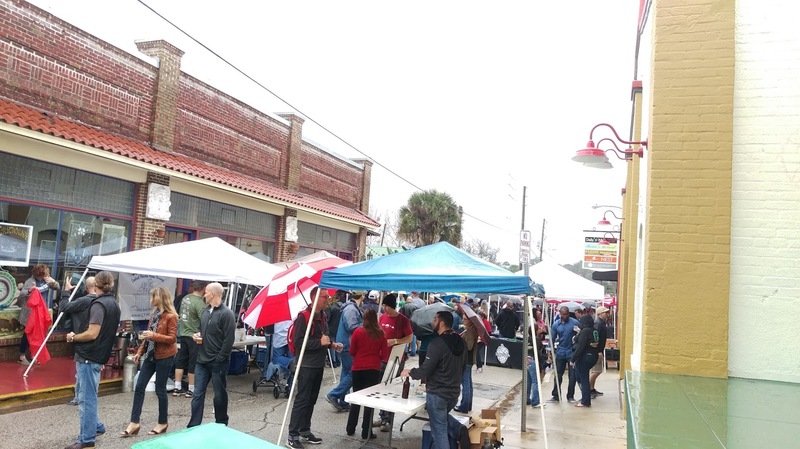 On this day, downtown DeLand was a bustling place; just earlier, the Mardi Gras Dog Parade was held on neighboring streets (in case you were wondering why there were dogs in tutus and such). 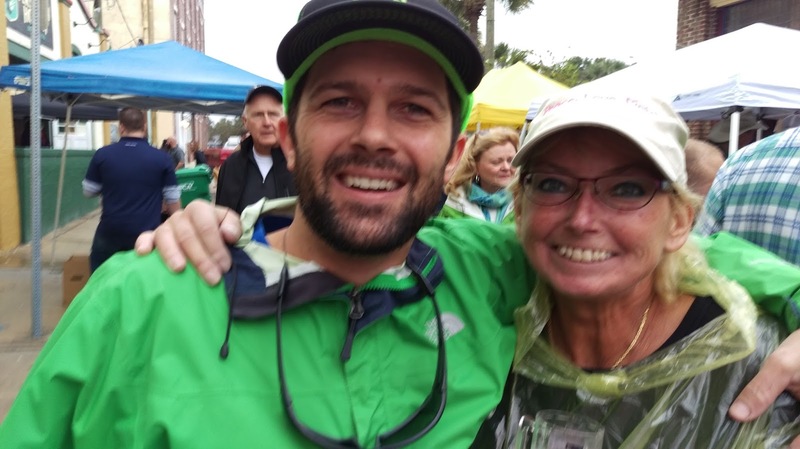 Main Street DeLand handles the organization of the Fest, and proceeds benefit the association. The Fest Committee is comprised of local beer community proponents, including Ann-Marie Bays, Vin Morrissey, Ed Irvin and Blair Willacker. 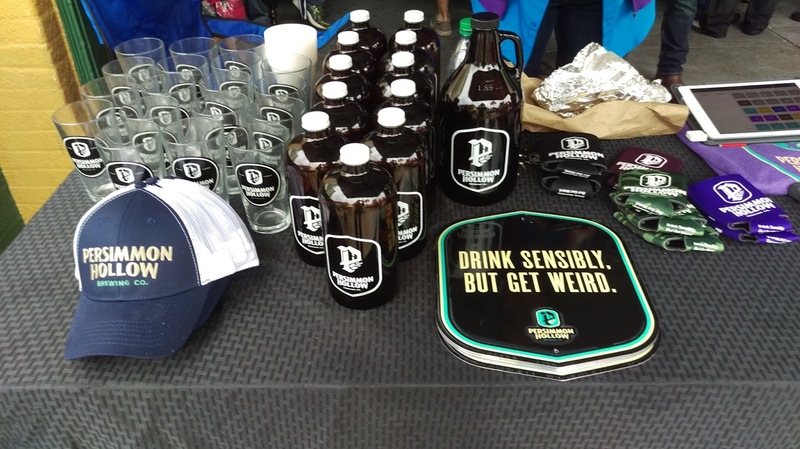 Although the Fest started off as a local/import beer festival, it has grown into one which showcases local craft while also offering a wide variety of national brands. This was my first time attending this Fest, and I'm already planning to return next year.